Now that Christmas is approaching and what better than to go to discover the many Christmas traditions that Italy can give us? In the cities moving events are held, such as cribs and many other various events. One of these places gives us a sign of peace for Christmas every year while it renews an ancient tradition: on December 23 in Lanciano, Abruzzo there is a very special day going on for those who are born and live there. At sunset, the streets of the town are filled with unusual animation, shops lowered their shutters, passers exchange greetings and head up to the Chiesa dell’Iconicella, about 3 km from the centre. To kick off the composed parade are the first tolling of the bell, called rings, located on the city tower of Lanciano. Arrived in the township Iconicella, it held a brief religious ceremony that gives the citizens the opportunity to meet and renew their bonds of friendship and solidarity, not forgetting to spare a thought for those from Lanciano had to leave and emigrated far away. 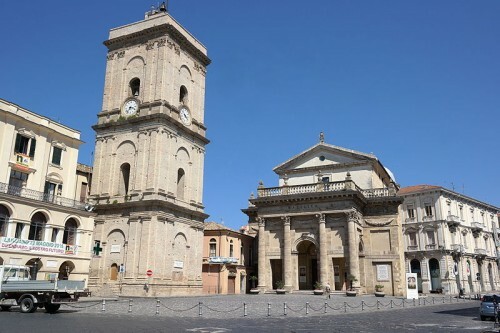 Everything takes place within 19 hours, when the church crowd returned to the tower, it will begin the concert with all the bells of the countryside, taking the note ‘a’ from the Lanciano rings. The invitation to the citizens is to return home, to kiss with love and respect their spouse, and the oldest person, exchange greetings and gifts in a ritual of peace and harmony that continues to retain all the characteristics of an ancient custom. The home ceremony takes place in an atmosphere of affectionate respect and often marks the overcoming of small misunderstandings or the pacification of contrasts. Around the table it will start a dinner that, although not reaching the variety of courses that constitute the Christmas dinner, it still look festive and special. Where everything turns quiet, the fireplace will be on and the “tecchio“, a root olive centenary get from their lands, is put inside to burn. It will last until the day of the Epiphany. The rings could be defined as a family feast, which opens up the Christmas celebrations. According to tradition, the Rings remember the journey that an archbishop of Lanciano used to make every year from 1588 to 1607, barefoot from his palace to the Chiesa dell’Iconicella, as penance but also to remember the journey of the shepherds to the cave of Bethlehem; many faithful accompanied him to listen to his short sermon of peace. During the pilgrimage the bell rang without stopping, until the return of the bishop in his palace. Some historians think that the rings represent the transfer to 23 December of the rite of reconciliation of Holy Thursday, common in many other countries and regions of Italy. Here in Lanciano it assumed all the characteristics of a particular tradition and original, so much is still tied to the spiritual heritage of the population. Despite the changes compared to the past, and some interruptions, this tradition today is deeply felt and evening two days before Christmas the bell is still feeling its peals thus the beginning of the holiday season. Those not participating in the parade can light a candle in your home. Given the character of the party it seems likely its origin institutional ecclesiastical note. The detail of the “holy bishop”, which follows the path barefoot reciting prayers to the Child Jesus, fits well in the climate of the Counter that, in time of religious folklore, has certainly favoured the medieval penitential reasons. The couple Child Jesus and ecclesiastical penitant is also present in many religious and folkloric events of the south of which Abruzzo was part culturally, historically and politically. Lying on the hills that slope towards the Sangro Valley, between the Maiella and the Adriatic Sea, Lanciano is the natural point of convergence, and the capital of the district Sangro-Aventino. Its origins are lost in prehistory: archaeological investigations testify to the presence of a Neolithic settlement and recent excavations in the Old Town have revealed the remains of the city of Anxanum, dating to the twelfth century. B.C. settlement of the oldest of Abruzzo. Since 1154 the city took the name of “Lanzano“; between the twelfth and fifteenth century reaches its peak both for growth and for the development of architectural fairs that will grow long the economy. Already known as the Roman “nundinae” , the fairs were held in the first nine months of the year in honour of Apollo on the Hill of the Selva where stood the temple dedicated to the pagan god. The third century saw the transferring to the state property outside of the plateau. So here the village developed increasingly, reaching its peak precisely in the fifteenth century. Linked to the transfer of the Fairs from the hill to the Forest Camp Fair (the current district of nineteenth-century ) is the construction of the bridge dedicated to the Emperor Diocletian in the third century, whose history is intimately linked to the construction of the Basilica of Santa Maria del Ponte. It is a monument unique for its fascinating civil and religious history a structure built with many twists and turns over some 15 centuries and that represents an architectural repertoire still to be discovered. Its uniqueness is enhanced by the excellent acoustics, making it a popular and impressive Auditorium concert Day Summer Frentana Music. “Gold Medal” for the Resistance, during the Second World War between October 1943 and June 1944 Lanciano was taken in the line of fire. The city underwent radical destruction while more than 500 people lost their lives. For nine months of hardships the population in Lanciano gave valiant fighters for the liberation struggle, supporting the Italian Resistance to Nazism, and it gave every noble example of patriotism and pride. 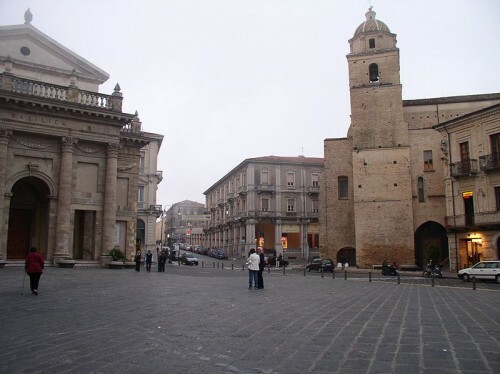 Lanciano is also the city of the Miracle: in fact the first Eucharistic miracle is kept in the Church of St. Francis. The story of the Catholic Church recorded the event which occurred in the seventh century. This makes it even more impressive a staying here. This entry was posted on Tuesday, November 17th, 2015 at 8:24 pm	and is filed under Discover Italy. You can follow any responses to this entry through the RSS 2.0 feed. You can leave a response, or trackback from your own site.